These systems are designed to take wastewater away for disposal from its original source of production so that the order of mundane operations can be maintained, notwithstanding the occasional spanner in the works. A useful response to the ill effects of these operations is the implementation of infrastructure such as wastewater treatment plants that essentially create ‘feedback loops’ in an otherwise linear system and help further the cause of the ‘circular economy’. This is easy to visualize for an urban setting where the ‘building blocks’ such as procurement of land, labour, and resources are already in place, or at least available at hand. It is also a very sustainable pathway for urban development. But what of communities far removed from these cityscapes? What of rural settings that might be relatively disorganized, or informal settlements marked by the absence of those ‘building blocks’, or any structural sewage or waste disposal system? Let us look at ‘Exhibit A’, Naya Tola Bishambharpur (NTB), a small village in the floodplains of Bihar’s West Champaran district. The people of NTB are living “within” the embankment of the Gandaki river, a location referred to as the “riverside” and recognized as a ‘flood prone’ area. Open defecation is rampant in North Bihar and this village is no exception. Toilets are conspicuous by their absence. This problem of open defecation gets compounded when the practice continues during the floods that arrive every year. Contaminated water surrounds the settlement of the 100 odd households here, which have to live with it every day as long as the floods last. There is also the threat of this water leaching into the soil and contaminating groundwater, that gets to the residents through their individual ‘chapakals’ or hand pumps. This can have serious health and sanitation implications. The wastewater problem manifests itself very differently in this region. The settlement has been at its current location only for the past thirty years or so. They moved here because the land where they used to live was inundated permanently by the Gandaki River. As it is, ‘riverside’ areas are largely left unattended because they are flood prone and ‘inaccessible’. This has impeded NTB’s recognition as being flood impacted and, in consequence, has impacted post-disaster assistance and recovery. In such a scenario, residents continue to live with wastewater around them during floods. The question of treating or reusing wastewater does not even arise considering the absence of basic sanitation facilities. This would obviously be the first step in ‘wastewater management’ in such a context. Not surprisingly, establishing a centralized sewage system is a distant dream. But perhaps a decentralized system of waste management can prevent waste from entering water in the first place. It would make it a tad bit safer to live with floods. This is where the Ecological Sanitation toilet comes in. This unique method introduces wastewater treatment in a socio-economic setting (like that of NTB) by keeping the waste out of the water. The decomposition of human waste and its eventual use as an organic fertilizer creates its own nutrient cycle and introduces circularity into the system. The use of humanure as fertilizer for crops in other villages in West Champaran has drawn positive feedback from farmers. 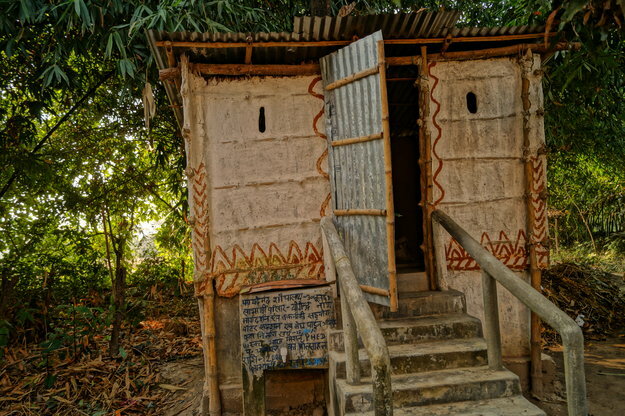 Thanks to the efforts of organizations like Megh Pyne Abhiyan and Water Action, the EcoSan toilet or ‘Phaydemand Shauchalay’ (beneficial toilet) as it is called locally, is gaining traction as an alternative sanitation technology in North Bihar. With floods set to become more intense and frequent as a result of climate change, it is also a potential adaptation option for vulnerable communities. However, the success of this decentralized system is contingent on a universal uptake of its technology. Wastewater management at the floodplain level will require the involvement of all stakeholders working to prevent the contamination of water above and under the ground. This calls for engagement, communication, and outreach aimed at policy-makers. A framework for this to work already exists in the form of the Swachh Bharat Mission (Gramin/ Rural). It aims to make India Open-Defecation Free by 2019 and also dedicates funds towards construction of individual and community toilets. It would help to rethink the design of the existing toilets under the scheme and make it context-specific. At the same time it would be needed to lay emphasis on areas of high vulnerability caused by, for example, people being flood prone, landless, or socio-economically poor – as is the case with inhabitants of NTB. The EcoSan toilet does away entirely with the need to use water to deal with our sanitary needs. This makes it suitable for both flood and drought prone regions. Perhaps it is wishful thinking, but imagine, in the looming water crisis, how much waste could be prevented from entering water, if such technologies could be upscaled in urban areas as well.